Jamaican Lifestyle - Hear it! IF THIS PAGE ON JAMAICAN LIFESTYLE SOUNDS CRAZY, WAIT 30 SECS FOR IT TO CALM DOWN! The essence of Jamaican life can be captured in a variety of ways. Sound is one of them. The truth is, though, that apart from our music and language, we hardly notice many of the sounds that make life in Jamaica so special. One night, I was on the phone with a Jamaican friend living abroad, and she told me that she could tell I was at home in the country. She said she could hear the tree frogs in the background, and the sound made her miss home. So I got to thinking that it would be good to try and capture Jamaican life in small sound clips. It really was a lot of fun getting these clips. Time consuming, but fun. Most of them are just a few seconds long, so it won't take you long to have this special Jamaican experience. Since it's what inspired this page, let's start with sounds of the Jamaican countryside at night. This next one woke me out of my sleep one night. I don't know why they make so much noise, or why they answer each other, or why they keep going on and on. Jamaicans, this one will give you cold bumps. That's right - a huge croaking lizard, out to evict me from my room! Then I thought I'd start really listening to morning sounds. I didn't realise how many birds were singing and doing their thing while I was getting ready for work. I now recognise the unique sounds of many birds. Here's a very common one. And here's a Woodpecker. All these sounds without leaving my yard! Of course, Jamaican lifestyle is nothing without the sound of its people. Hear the sounds of a Jamaican market, early on market day. 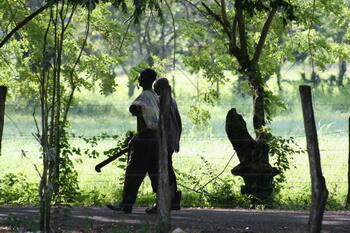 Music playing, the squeaking of hardcart wheels, a male and a female vendor arguing over a spot to display their goods. Listen carefully to the woman's response telling the man where he can find his spot. Done in fun, but she dis him bad! There's something overwhelming about the singing of hymns at a Jamaican funeral. And finally, I'll leave you with sounds of the seashore. I hope you dream about us tonight.